"Adventure is where you lead a full life." Check out our new season of Caribbean Pirate Treasure on the Travel Channel premiering this summer. His conservation efforts are focused on solving global social and environmental problems. In 2004 he founded EarthEcho International dedicated to inspiring youth to act now for a sustainable planet. With a over ten years in operation, EarthEcho has established itself as a leading youth environmental education organization. Philippe and his wife, fellow adventurer and TV host Ashlan Gorse-Cousteau, reside in Los Angeles, California. Follow Philippe and Ashlan Cousteau as they travel throughout the Caribbean exploring unsolved maritime mysteries, pirate histories, and legends of lost treasures. Each episode will explore a new tropical destination and the unique history that has shaped it into what it is today. For hundreds of years, the stories of pirates and lost treasure scattered around these islands have captivated the imagination of people around the world. With the help of local experts, historians, and archaeological institutions the Cousteaus pursue the high adventure of exploring the unknown; delving into the rich history of a region that for centuries has been at the crossroads of the New and Old World. Inspired by the legacy of Philippe’s father and grandfather, the adventurous couple travel from lush jungles and thick swamps to the beautiful coral reefs and historic shipwrecks of the Caribbean in their search for answers. Each week Philippe hosts and co-executive produces a 30 minute riveting earth science documentary series that explores the most spectacular places – on the earth, inside the earth, and above the earth. Syndicated on Fox stations throughout the country each Saturday morning and available free on Hulu.com the third season of Awesome Planet will premier in the Fall of 2016. Awesome Planet Sizzle from Steve Rotfeld Productions on Vimeo. 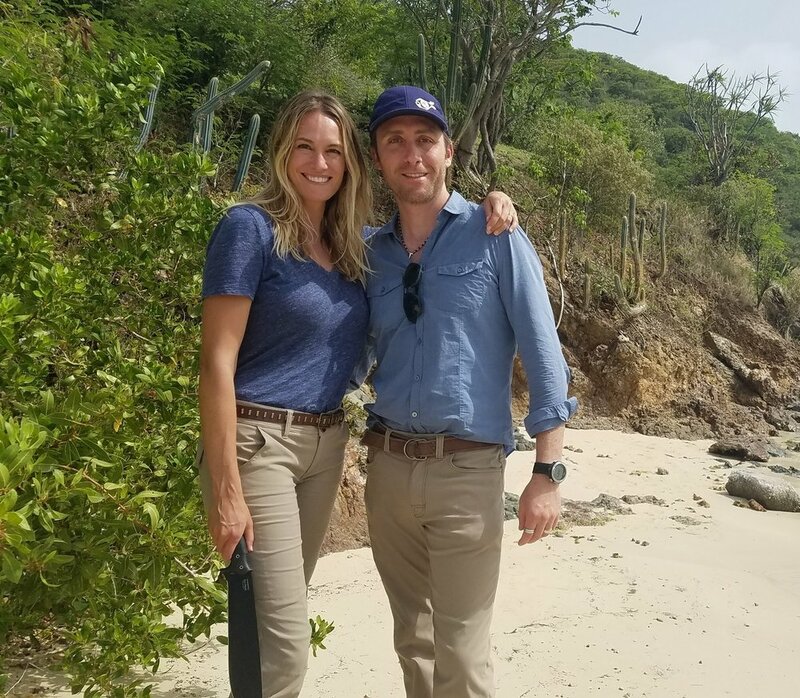 Philippe Cousteau, and his wife Ashlan Gorse Cousteau travel to the Bikini Atoll to explore a marine environment destroyed by nuclear testing during the Cold War. The nuclear devices detonated across the atoll vaporized two islands and destroyed every living thing. Remarkably, 70 years later, nature has proved resilient and restored the marine ecosystem, re-populating the atoll with reef sharks. But since reef sharks are considered non-migratory, where did they come from? How did they re-populate these remote atolls? The team tags 17 sharks with GPS satellite tags and discovers that sharks do indeed migrate atoll-to-atoll. Unfortunately and unexpectedly, the team also uncovers an illegal fishing fleet taking sharks from inside one of the largest shark sanctuaries in the Pacific. Philippe Cousteau introduces us to narwhals, unicorns of the sea. The grandson of famed explorer Jacques Cousteau studies and explores the world's oceans just like his grandfather. His quest is to find a narwhal in the wild of the arctic. Philippe hosts 2 seasons of a series for GreatBigStory.com about the weird, the wonderful and the shocking creatures found in the ocean. As a tongue in cheek tribute to The Life Aquatic and therefore to his own legacy, this series is a fun and unexpected way to explore real science. In partnership with Takepart.com, Philippe and Ashlan launch a new series exploring hope in the face of the global poaching crisis. "The black market demand for exotic animal trophies threatens some of our world's most valuable natural treasures. Ashlan and Philippe Cousteau, along with the World Wildlife Fund and the Leonardo DiCaprio Foundation, journeyed deep into the jungles of the Terai region of southern Nepal in search of wildlife. Join them as they seek answers to an important question: How has this impoverished nation stemmed the tide of illegal poaching?" Acclaimed environmental advocate Philippe Cousteau and renowned author Deborah Hopkinson team up to offer a story of the powerful difference young people can make in the world. Meet Viv, who has a new home and a new school by the sea, and follow her as she finds her way in a new place and helps bring together a whole community to save the sea turtles of the South Carolina coast. Going Blue educates young people about the earth’s water crisis and gives them tools and inspiration to transform their ideas into action. With lively photos and practical suggestions, the book helps teens plan and do a meaningful service project that benefits our planet’s water system. Along the way, readers learn about issues such as clean water access, coral reef damage, runoff pollution, trash islands, factory fishing, bottled water, and much more. This elementary-level counterpart to the award-winning Going Blue: A Teen Guide to Saving Our Oceans, Lakes, Rivers, & Wetlands teaches elementary kids about the earth’s water crisis and empowers them to do something about it. Filled with facts about our waters, their inhabitants, and the threats they face, Make a Splash! presents inspiring stories of kids in action and service projects for kids to help them make a difference. I founded EarthEcho International in 2004 because I believe that youth are the hope for our planet and that a strong and effective environmental movement must be built through the next generation. I am proud to say that EarthEcho has become the leading youth education organization dedicated to inspiring youth to act now for a sustainable future. It was founded in honor of my father Philippe Cousteau Sr.